AccuWeather, the world’s largest and fastest-growing weather media and business company, wants users to get “AccuWeather Ready” for winter, and the company is publishing new safety resources and hosting live online events to help people recognize and minimize their risks. AccuWeather Ready content is designed to provide useful news, information and tips to help users protect their families, properties and businesses by making the very best decisions when weather is a factor. 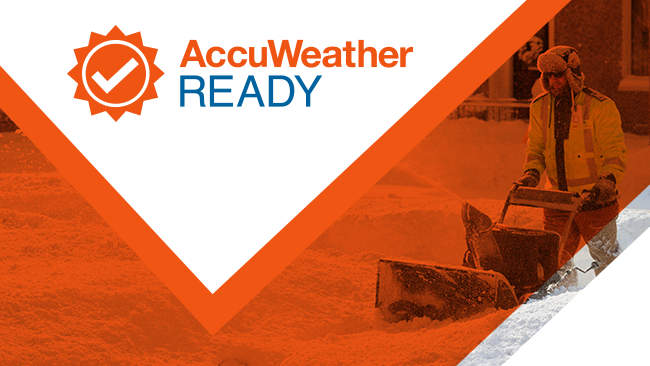 The AccuWeather Ready site at http://accuweather.com/ready includes compelling educational weather news and videos, facts about the potential health impacts of different winter weather events, safety tips and resources, personalized weather preparedness plans, detailed checklists, and more. AccuWeather Ready videos are also featured on the AccuWeather Network, currently offered on Verizon Fios, Frontier and DIRECTV cable systems. Users also can view AccuWeather Ready videos and receive severe weather push notifications in the free AccuWeather app on iOS and Android. New safety information will be available at www.AccuWeather.com/Ready starting November 14 to help users prepare for winter weather risks. To further raise awareness, AccuWeather will also present a series of live online events each Wednesday from November 14 through December 19 at 1 p.m. U.S. EST. The events will explore winter safety concerns and issues in depth, with experts from AccuWeather and other organizations. The live events will be viewable on Facebook, Twitter, and YouTube. Nov. 14: Seasonal outlook and general preparedness tips, featuring AccuWeather Senior Meteorologist Brian Wimer. Nov. 21: Winterizing your car and driving safety, featuring Michael Clitherow, Service Manager at Bobby Rahal Honda of State College, Pennsylvania. Nov. 28: Skin and beauty tips for winter season, featuring Dr. Lorraine Rosamilia, Dermatologist from Geisinger Health System, and sponsored by The O’Keeffe’s Company, which makes Working Hands and other moisturizing balms. Dec. 5: How to stay healthy during winter’s cold and flu season, with an expert from the Centers for Disease Control and Prevention. Dec. 12: Respiratory and cardiac concerns associated with winter-related activities, featuring Frank Cianfrani, Staff Education Coordinator at Centre LifeLink EMS. Dec. 19: Avoiding frostbite and other risks of winter sports and activities. By providing forecasts and warnings verified for Superior Accuracy™ across all major platforms, including both digital and traditional media, AccuWeather helps save more lives, keeps more people safe, and helps people and companies plan more effectively in all weather conditions. In the most comprehensive study of forecast accuracy ever undertaken, AccuWeather was overwhelmingly reconfirmed by independent industry tracker ForecastWatch as the world’s most accurate source of weather forecasts in the categories tested-precipitation, wind, and high-temperature forecasts. More importantly, AccuWeather forecasts have superior value that goes well beyond what is demonstrated in this and all other independent forecast accuracy comparisons. The reasons for this are numerous. First, AccuWeather forecasts are more localized than other sources. Further, they are more detailed and extend further into the future. For example, the independent verification by ForecastWatch was based on comparing all New York City forecasts, but AccuWeather provides further detail for 279 neighborhoods within New York City and most other sources do not, which means AccuWeather delivers Superior Accuracy not even captured in study after study of statistical forecast accuracy comparisons. Another advantage is AccuWeather MinuteCast®, which gives accurate, minute-by-minute forecasts of precipitation up to two hours ahead. In fact, the ForecastWatch study concluded that AccuWeather’s probability of precipitation forecasts, which are key to MinuteCast forecasts, were 21 percent more accurate than those of the next-ranked provider and 23 percent more accurate than the average of all other sources. This powerful combination of accuracy and detail, both in location and time, make AccuWeather forecasts many times more valuable than any other source. The AccuWeather Ready initiative helps users make the best decisions when severe weather is concerned by providing weather preparedness updates, tips and tools when they matter the most, helping people personalize the weather to improve their lives. The AccuWeather Ready program demonstrates AccuWeather’s continued leadership and commitment as a U.S. National Oceanic and Atmospheric Administration (NOAA) Weather-Ready Nation Ambassador. NOAA named AccuWeather as one of its first Ambassadors in the weather enterprise initiative, launched in 2014 to recognize organizations committed to helping the nation be better prepared for, respond to, and recover from weather-related disasters. AccuWeather and NOAA have been partners for many years. The company has supported NOAA and National Weather Service (NWS) budgets in testimony and presentations before the United States Congress and with the Office of Management and Budget, as well as other federal agencies. AccuWeather has been a longtime cooperation partner with NOAA.